Oh dear! This week it’s Elap, he of triangular numbers from two years ago. Here we had a wide open spaced 8×8 grid only populated with clue letters, no bars. Unlike Three-squared, which dealt with triangles, this one had clues to the sides, perimeters and area of squares. Eventually, every row and column would need to be completed thematically, and a couple of lines drawn. So at the bottom of today’s effort is my attempt at a detailed solution. 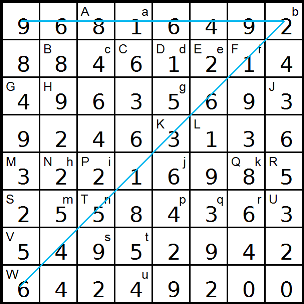 It was, I have to say, fairly obvious that the two lines which would end up showing what was otherwise missing from the puzzle would be in the shape of the number 7. That was made ever so obvious by the title which was Seven with S moved to the end. However, as with many early penny drops, it didn’t help much. 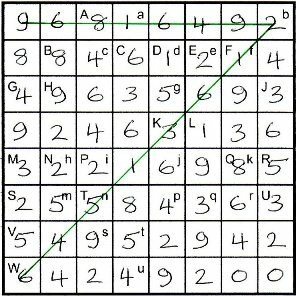 I started by highlighting those squares which contained the last digit of a clue term, eg the last digit occupied by C3, G3 and V2 in 1ac. Square 6 was the place I started, and two entries went in the grid fairly early on … well, after about 40 minutes! As with many mathematicals, it was like chipping away at a pyramid — although you felt you were progressing, there seemed very little to show for it. But I got there in the end. After all the clues were solved, the grid was complete … except for those pesky six empty squares, three in the top left and three in the bottom right. Unlike the triangular number in Elap’s last puzzle, it didn’t take too long to realise and verify that all the rows and columns formed squares if started in the right place. Moreover, the main SE-NW diagonal was a square, not to mention 1ac twice: 81649296 and 92968164. It has to be said that refining, tarting up and keying in my original notes took well over twice the time that it took me to solve Elap’s puzzle in the first place, which was about 4½ hours. I hope you’ll forgive this first attempt, which is nothing compared to erwinch’s efforts, especially in their lack of colour. I’ll try and do better next time! In this table, I have marked unknown digits with the • character, and even digits with an E, eg 12•E•. This entry was posted on 7 December 2012 at 5:00 pm	and is filed under Solving Blogs. You can follow any responses to this entry through the RSS 2.0 feed. You can leave a response, or trackback from your own site.